Hitting the 'big time' as they did with the phenomenal success of Bohemian Rhapsody in Christmas 1975, it was about that time that I became acquainted with the music of Queen in a proper way. I'd been aware of stuff like Killer Queen previously, but never really explored the band further until then. A Night at the Opera was an eye-opener for me, and demonstrated the breadth of the band's song-writing talent, from neo-operatic to almost vaudeville. A Day at the Races followed the following year, but that left me a little cold, as it seemed to me to be almost a repeat of 'Night...'. As we moved into the autumn of 1977, a new Queen album was mooted. Would it be more of the same or not? Perhaps as a taster for what was to come (isn't that what singles were?) the band released the opening two tracks as a double-A side single, which gave a big hint of what we were to expect. 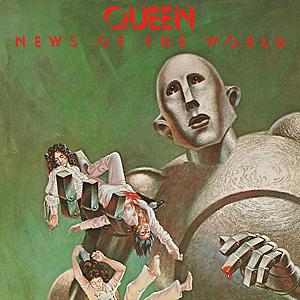 'News of the World' appeared on 28 October. There were intimations of what had gone before - this was definitely Queen - but new directions were evident too. It would be fair to say that the opening two songs: 'We Will Rock You' and 'We Are The Champions' have gone on to become anthemic, and at the time they were different and exciting - though '...Champions' is perhaps more 'Bo Rhap'-ish with its operatic trills in the 'on and on and on' sections. 'Sheer Heart Attack' was, I thought at the time, a rebuttal to the raw energy and simplicity of punk (though it had been around in some form since the band made the album of the same name in 1974). All the band were involved in song-writing here: May produces some wonderful quirky blues with 'Sleeping on the Sidewalk', and something approaching the prog of 'The Prophet's Song' with 'It's Late'; and John Deacon again showed himself to be a fine exponent with 'Spread Your Wings' - on a par with his 'You're My Best Friend' from 'Night...' (maybe 'Who Needs You' is more akin to 'You and I' on 'Day...'). Taylor's 'Fight From The Inside' and Mercury's 'Get Down Make Love' also show a new direction in the band's music which proved to be innovative, if a little confusing to a pubescent rock fan: was this rock or not? To my mind this was the band's last really good album, ending a sequence that began with maybe their debut and definitely their sophomoric offering: I never really 'got' their material from 'Jazz' onwards. But this is a fitting end (for me) to an excellent run at the start of what was to become a glittering career.